"ABE LINCOLN" is alive and well in Jasper, GA! 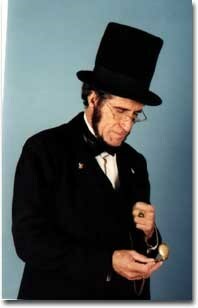 Whatever type of event you are planning, you can have our 16th President available to inspire, motivate & entertain your guests. Homer has been an ABE IMPRESSIONIST since 1975 in 47 states, at 2,204 locations in front of two million people. Your audience will leave with a renewed sense of patriotism for our country and NEW positive thoughts about themselves and their ability to BECOME! ABE speaks of "being dreamers, star-gazers, rainbow chasers & soaring with the eagles" and you can't soar with the eagles if you're clucking around on the ground with the chickens! GRADUATION CELEBRATION & PARTY SPEAKER! This ABE actually worked in the White House with President Johnson for two years and three months and needs NO makeup to be in character. Homer has his 300+ pages book, "Image in the Mirror", available to sign for those wishing to purchase one. And picture-taking is allowed at any time during or after his performance. If you and your audience are not totally pleased with Mr. Lincoln and his trip from the log cabin to the White House your money will be refunded in full! HONESTLY! Once you have my website address you may wish to go there to see my experiences for the past 41 years and if you click on the listing from the home page and then put "Keynote" in the search places section you will see all those places I've spoken as their KEYNOTE SPEAKER. We at the Warrior Transition Battalion could not be more pleased with the personal touch and 150% efforts of President ABE Lincoln. He not only presented to our unit as contracted, but he also provided our folks with free angel coins and inspirational prayer cards. He also then walked around our military hospital and provided encouragement to the staff and to visiting patients. This man made a HUGE and lasting impression! We will not soon forget the day ABE Lincoln visited our Fort Gordon, Georgia. This is one speaker you will be totally pleased with the results. Use him! Use him! USE HIM! We love you Abraham Lincoln!!!!! Homor Sewell is awesome!! 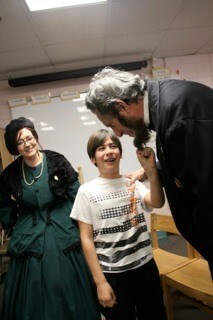 The students, teachers and chaperons on this field trip had a great time and raved about our Abe Lincoln presenter. The students all wanted a picture with him. He was just fantastic. I would highly recommend Mr. Sewell to anyone who wants a professional, talented, knowledgeable and engaging presenter. 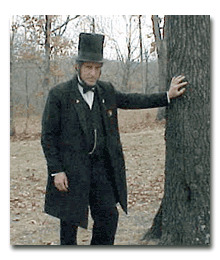 Please note President ABE Lincoln Impressionist will also travel to Eton, Maxeys, Talking Rock, Tate, Marble Hill, Varnell, Oakman, Tennga, Ball Ground, Waleska, Ellijay, Canton, East Ellijay, Ranger, Fairmount, Rydal, White, Cherrylog, Dawsonville, Nelson.